This is one of the African violets that I grew from a stem cutting. I brought it with us as a gift to my father-in-law and his wife, yesterday when we drove up for a visit. I wanted to show you how I put together a simple but nice presentation. After pulling off all of the poor-looking leaves, I used a pink plastic shopping bag for a waterproof wrapper. I cut a square out of the pink bag, just big enough to cover the pot entirely, and for the four pink corners to fold out to embrace the plant nicely. The plastic is held onto the pot with a rubber band, and a ribbon tied on top of the rubber band. Very simple. 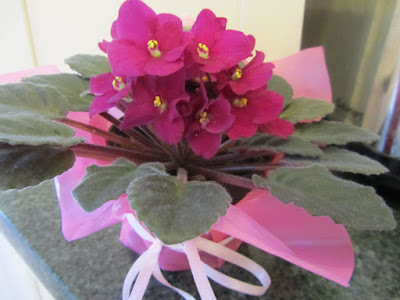 The African violet took 2 full years to grow from a single leaf to a full plant with blossoms. I have one more of these cuttings-turned-plant to give away. Looks like I'll be needing to take a few more cuttings this fall. Anyway, just thought I'd show you how it all came together. The packaging makes it look all professionally done. :) What a nice cheerful gift! Thank you, Cat! And I think it was well-received. I wonder if frugal people just like plants. I went to a charity sale this spring and purchased an aloe plant that has just taken off. I gave babies from it for a 25 th wedding anniversary celebration. They had asked for donations to the food bank but I knew these friends supported the original charity and the one where I got decorative plant pots. Then last week I gifted some more to someone moving into a new place . When my mother died I had held onto some of the decorative plant pots of hers. I'm hoping to transplant some more baby aloes and give them to my kids. Your aloe babies make wonderful gifts, and especially as you have saved those decorative pots for placing them in. Sounds very nice, and well-received! I also had brought items for he food bank as my friends had wished for their celebration, not just the plants. Very pretty! I'm not one of those people who do well with African violets, but you obviously have the touch. I wouldn't say that I have the touch, but I have the "spot". I stumbled upon the perfect spot in our house for them. It's in the kitchen, near the sink, so they get watered, but also near a window, for some indirect sunlight. My biggest problem with indoor plants of any sort is watering consistently. So, if a plant is not near the kitchen, it's probably not going to get watered by me. I have never seen a healthier, full African violet plant. Usually the ones sold at garden shops are smaller, with fewer blossoms, and always lopsided. I'm sure your beautiful gift was well received! !